Mil-PRF-49470 capacitors are preferred over DSCC-DWG-87106 capacitors. The Mil-PRF-49470 specification was developed as part of a cooperative effort between the US Military, NASA and the SMPS suppliers to produce a robust replacement for the DSCC drawing. The military specification product provides additional quality assurance provisions that are NOT required by the DSCC drawing. Two product levels are offered in Mil-PRF-49470: the standard “B” level, suitable for standard Class “H” military applications, and the high reliability “T” level, suitable for Class “K” space level applications. Some of the benefits of the Mil-PRF-49470 product over the 87106 product include: Formal qualification process (QPL established); Mil-STD-790 compliance; DSCC audits; routine qualification maintenance testing (ie., life testing); Group A percent defective allowed (PDA) specified; prohibits mixing of chips from different production lots within a single SMPS stack lot. Mil-PRF-49470 “T” Level product is recommended for all high reliability applications. Mil-PRF-49470 “T” level product requires in-process inspections and additional Group A and B screening inspections that are not part of the normal “B” level flow: In-process screening that includes non-destructive internal examination (chip level) and destructive physical analysis (chip level); Group A destructive physical analysis (finished stack level); Group B lot specific humidity, steadystate, low voltage (lot sample test); and Group B lot specific thermal shock and life test (lot sample test). Popular selected values of this version of NPO are being qualified. 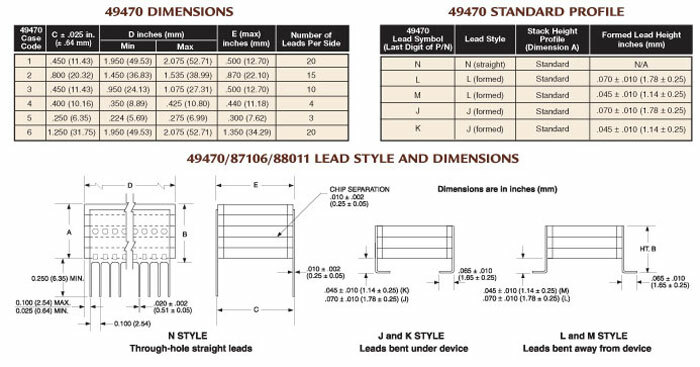 For more information, contact Presidio Components at 858-578-9390 or visit our website at www.presidiocomponents.com.